Our latest research reveals there is an accountability crisis in organizations today, and it is a crisis of epidemic proportions. Study participants overwhelmingly describe a negative view of accountability, that it is something that happens to you when things go wrong, rather than something you do to yourself to ensure results. Our research reveals that only 15% of organizations say key results are clearly defined in a way that employees at all levels can engage, pointing to a large-scale and prevalent misalignment around key organizational goals. The result is widespread confusion, significant organizational under-performance, and failure to meet key objectives–among the majority of the world’s companies! 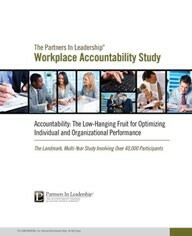 Review the executive summary of our latest study revealing an accountability crisis in organizations today of epidemic proportions. 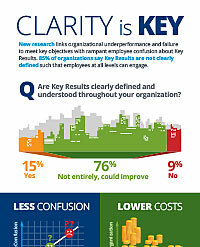 This infographic sheds light on the staggering finding that only 15% of organizations say key results are clearly defined. 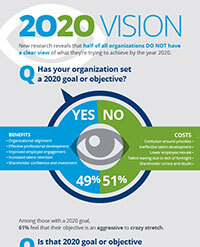 Does your organization have a 2020 goal or objective? We’ve found that companies that set long-term goals, three or more years out, see far more benefits over companies that only look one to two years ahead.